Terrifying 20‚336 murders in SA between 2017/2018, some citizens clamour for 'DEATH PENALTY' Is the death penalty a deterrent to crime? - News around the clock!! As some South African citizens continue to clamour for the reinstatement of the ‘DEATH PENALTY’, following the terrifying figures released by Crime Stat South Africa and the reaction of some countries like the US, who are now concerned about the safety of their citizens, more experts are now weighing in, on the vexxed issue of whether or not the ‘Death Penalty’ can be a deterrence to crime. Already, the US Department of State on Wednesday issued a travel advisory to its citizens travelling to South Africa, following the release of the annual crime statistics by the SA Police Service. The terrifying crime stats released two days ago by crime stat; recording 20‚336 murders in SA between 2017/2018, the US state department warned its citizens to “exercise increased caution” in SA. Capital punishment is a legal penalty in India. It has been carried out in five instances since 1995, while a total of twenty-six executions have taken place in India since 1991, the most recent of which was in 2015. The Supreme Court in Mithu vs. State of Punjab struck down Section 303 of the Indian Penal Code, which provided for a mandatory death sentence for offenders serving a life sentence. The number of people executed in India since the nation achieved Independence in 1947 is a matter of dispute; official government statistics claim that fifty-two people had been executed since Independence. However, research by the People’s Union for Civil Liberties indicates that the actual number of executions is in fact much higher, as they located records of 1,422 executions in the decade from 1953 to 1963 alone. Research published by National Law University, Delhi on death row convicts since 2000 had found that of the 1,617 prisoners sentenced to death by trial courts in India, capital punishment was confirmed in only seventy-one cases. NLU Delhi confirmed 755 executions in India since 1947. National Law University, Delhi examined 1,414 prisoners who were executed, in the available list of convicts hanged in post-Independence since 1947. According to a report of the Law Commission of India (1967), the total number of cases in which the death sentence was awarded in India from 1953-63 was 1410. In December 2007, India voted against a United Nations General Assembly resolution calling for a moratorium on the death penalty. In November 2012, India again upheld its stance on capital punishment by voting against the UN General Assembly draft resolution seeking to end the institution of capital punishment globally. The criminologists surveyed included – 1) Fellows in the American Society of Criminology (ASC), (2) Winners of the ASC’s Sutherland Award, the highest award given by that organization for contributions to criminological theory, or (3) Presidents of the ASC between 1997 and the present. Those presidents before 1997 had been included in the prior survey. Respondents were asked to base their answers on existing empirical research, not their views on capital punishment. Nearly 78% of those surveyed said that having the death penalty in a state does not lower the murder rate. In addition, 91% of respondents said politicians support the death penalty in order to appear tough on crime – and 75% said that it distracts legislatures on the state and national level from focusing on real solutions to crime problems. Over all, 94% agreed that there was little emperical evidence to support the deterrent effect of the death penalty. And 90% said the death penalty had little effect overall on the committing of murder. Additionally, 91.6% said that increasing the frequency of executions would not add a deterrent effect, and 87.6% said that speeding up executions wouldn’t work either. Public opinion also reflects these findings. 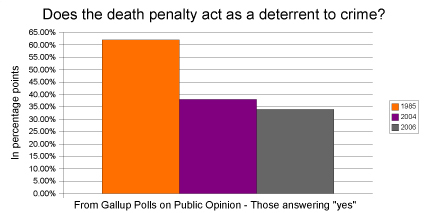 In a 2006 Gallup Poll, only 34% of respondents agreed that “the death penalty acts as a deterrent to the commitment of murder, that it lowers the murder rate.” In 2004, 62% of people said the death penalty was not a deterrent. By contrast, in 1985, 62% believed the death penalty acted as a deterrent to murder. (Source: M. Radelet & T. Lacock, “Do Executions Lower Homicide Rates? The Views of Leading Criminologists,” 99 Journal of Criminal Law & Crimonology 489,Northwestern University (2009)).